I don't know about you, but I'm more than ready for winter to be over. While I wouldn't exactly describe myself as a full-on outdoorsy type, there is something to be said for being able to walk around outside, sniff the flowers, not get frostbite in your toes. Maybe I've been watching too many nature documentaries lately. In any case, I was browsing around ShopLately and started to notice tons of accessories that reminded me of springtime. Coincidence? Maybe, maybe not. But I'll be sharing a few of my favorites today either way. ShopLately is an online marketplace featuring a variety of designers and merchants. Think Etsy or eBay, except fashion and beauty-focused, plus much easier to navigate. Hooray! You'll find a mixture of handmade, indie goodies and mass-produced brands in the marketplace. New customers can get $10 credit towards their first purchase of $15+ by signing up via Facebook through my referral link. I picked up items from multiple ShopLately merchants this time, all based around one theme: Nature in springtime. Oh, to be free from dirty ice and frozen fingers. How does that old saying go... "The birds and the bees and the flowers and the trees?" All of those things will come back to life once spring is here, and personally I can't wait. Well, maybe I can wait for swarming bees. But I do dig this beehive-inspired ring from Opaque Lion, which is available in gold, silver and rose gold (pictured above). Speaking of trees, I can't wait until they start growing leaves again. I'm sick of seeing barren branches in my backyard. 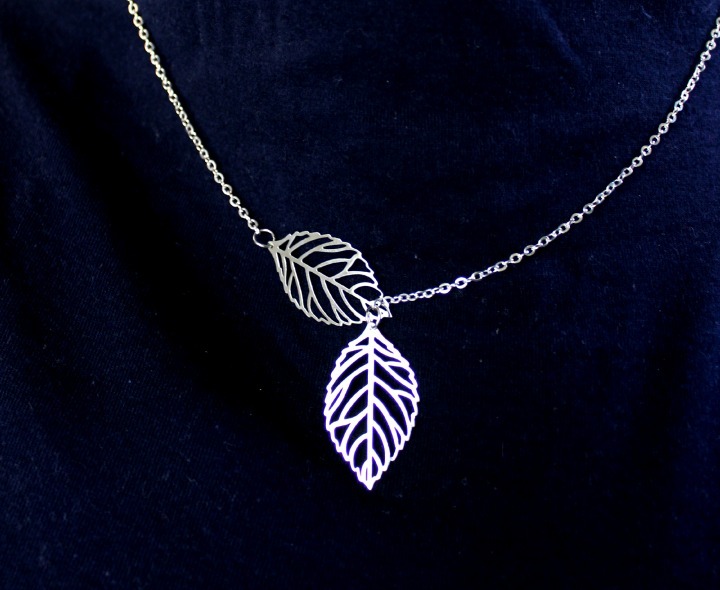 Until then, this delicate leaf necklace will have to do. When I was a kid, one of my favorite things to do in the spring was look for rocks and shells on the beach. It was too cold to go swimming, but there were lots of treasures buried in the sand waiting for anyone who was willing to look. I can't say that I ever found anything as pretty as these peach lava rock/quartz stones during my beach combing adventures, but it reminds me of them nonetheless. On a related note, one of the most fascinating things in my childhood home was a split purple quartz geode my father kept on his bookshelf. I would stare at it for hours. (What? We didn't have the internet back then, so had to stay entertained somehow.) I would try to break rocks open in the hopes of finding similar inside, but as I'm sure you can guess that probably didn't go too well. 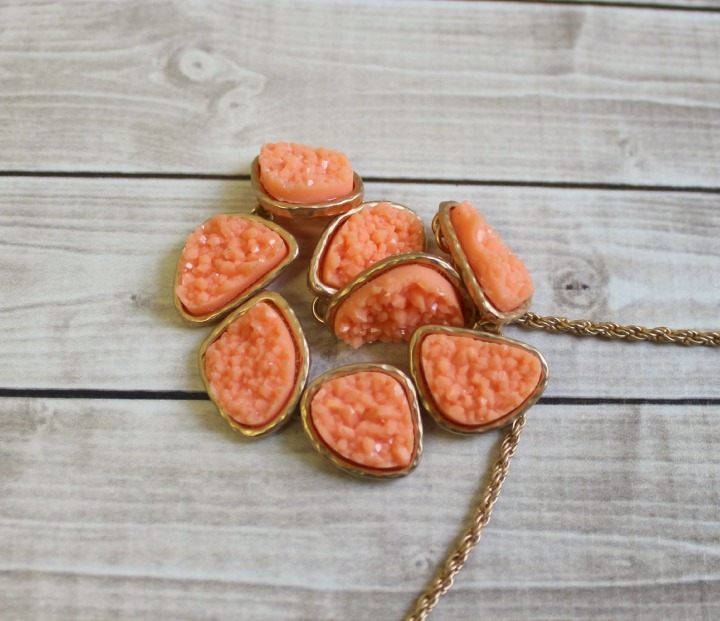 Thankfully I don't have to break rocks to get this beautiful layered necklace from A'Muse Me Boutique (which comes with matching earrings too, unlike your average random geode). 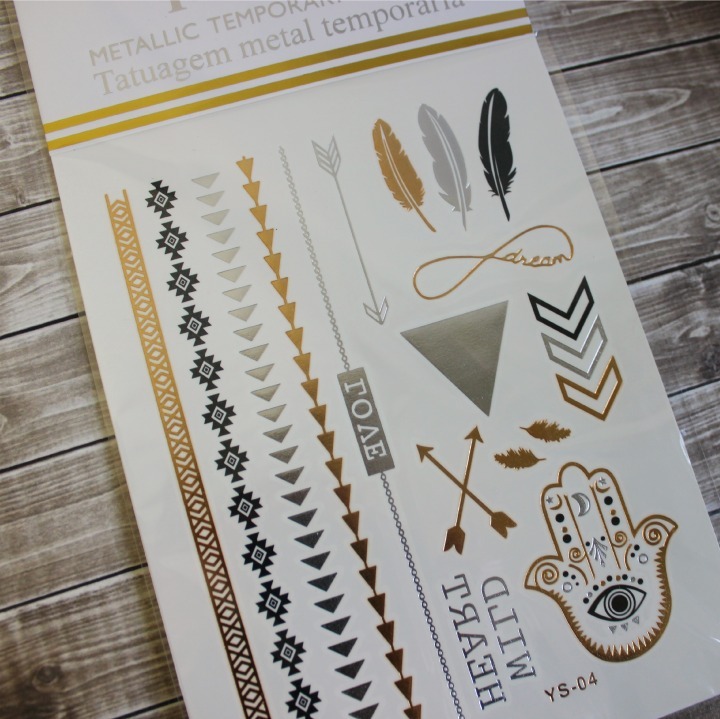 I'm not sure exactly where the metallic temporary tattoo trend started, but I've been seeing them EVERYWHERE lately. I never thought I'd be drawn to rub-on tattoos as an adult, but these are actually quite beautiful. I was particularly drawn to the feather patterns—I suppose I'd rather be outside frolicking with the birds right now. By the way, these are actually sort of durable if you don't actively scrub them—both of the tattoos in the picture survived a hot shower intact. Whoa! For more lovely springtime baubles, visit ShopLately and have a browse. Be sure to check out the sale section while you're at it—there are actually several spring-themed events happening at the moment! Don't forget that you can get free shipping with your trial of the Insider Program and $10 off your first purchase $15+ by signing through Facebook via this link. Now that you've seen a few of my springtime favorites, how would you like a chance to win a couple of them for yourself? To enter, use the Rafflecopter widget below. Each entry method may be done once per person except for retweets, which may be done once per person per day. The full Terms & Conditions can be found in the Rafflecopter widget. This giveaway is open to residents of the United States only. 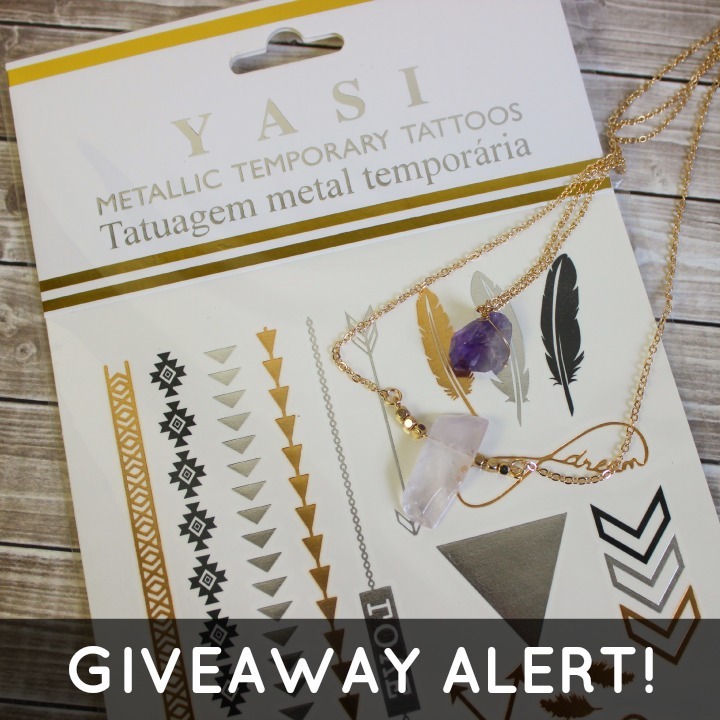 The prize is one Bohemian Metallic Flash Tattoo set and one Purple Stone Layered Necklace Set. The approximate retail value of this prize is US $21, sponsored by ShopLately. 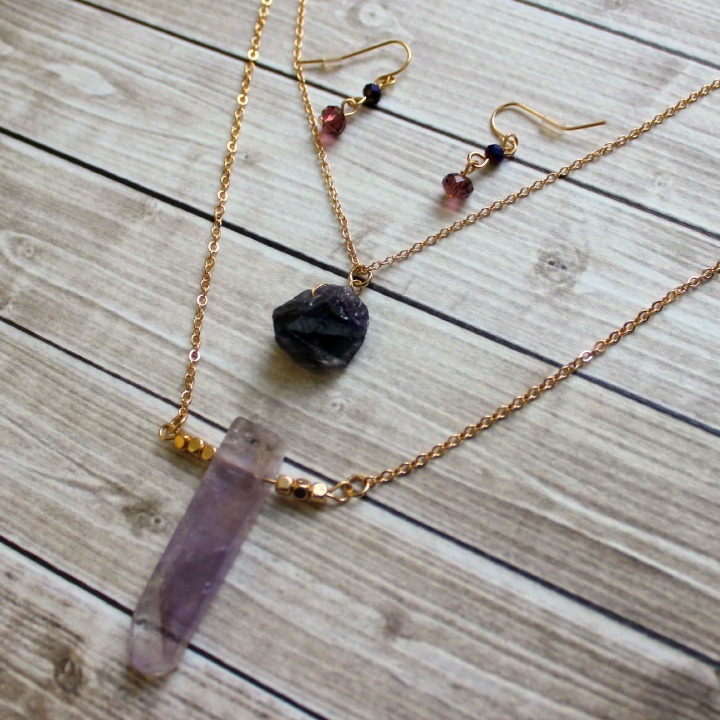 Please note that the necklace set is made with natural stones, so the size and shape may vary a bit from what's pictured above. The giveaway ends at 11:59PM EST on March 12th, 2015 and one winner will be selected at random via Rafflecopter. The winner will be contacted via e-mail and has 48 hours to respond in order to claim their prize. If the first winner fails to respond in time, another will be drawn at random. So make sure you're logged into Rafflecopter with an e-mail address you check very frequently! What do you think of my springtime ShopLately picks? Are you ready for a change of seasons? Disclosure: The items featured in this post were purchased with ShopLately credit provided to me for promotional purposes, however any opinions expressed above are honest and my own. I did not receive any other form of compensation. This post contains affiliate links. For more information, check out my full disclosure policy. The filigree large cutout clutch reminds me of spring because of the colors. The detailed cutouts remind me of flowers. Love the gold double infinity ring! The "Smell the Roses" dress reminds me of spring - can't wait for the warmer weather and the flowers to bloom! that reminds me of Spring-- it is so cute! The Tila Wdge reminds me of Spring. I love wedge heels in the warmer months. I really like the 'Automatic blue map umbrella', I've always loved maps, I have many vintage prints on framed around tthe house. Not only is this so colorful and 'Springy' but of course rain reminds me of Spring, wearing my rain boots and enjoying the smell after a storm. 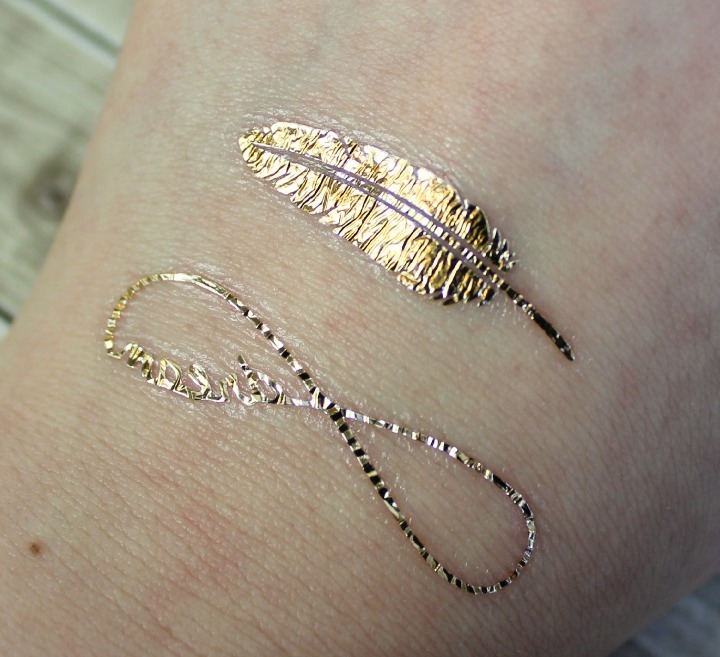 Love the leaf necklace and the foil tattoos! Those tattoos are cooooool. I'm probably not cool enough for them, but I think I'd wear 'em anyway. I'm not very cool and they totally stuck to me, so I think you're good to go. I like them a lot! They seemed sort of gimmicky to me at first, but they're actually quite pretty. The pleats to meet you skirt reminds me of spring probably because its fresh and clean looking! The Tear Drop Aqua Necklace reminds me of spring because of the colors! I sort of like that temporary tattoos are in, but I don't know how I would wear them. The band-shaped tattoos are pretty subtle. It's still a bit too cold for this, but I think it would be fun to use one as an anklet once it warms up enough to have your legs exposed! Great choice - it's on my wishlist! The sweet treats peplum top reminds me of spring with the cut of the sleeves and the print reminds me of warmer weather. Weekly Poll | Still Life with Fruit.